Carl Phillips (J McC Kawasaki) leads Alistair Kirk (McCurry BMW) at the Ulster Superbike meeting at Bishopscourt on Saturday. Picture: Pacemaker Press. Phillips has joined Jason McCaw’s team alongside Ryan Gibson for 2019 and the former British Supersport and Superbike rider wasted no time in making his mark on his Kawasaki ZX-10R. He won the first race after fending off a determined charge by Alistair Kirk on the AKR McCurry BMW, with only two-tenths-of-a-second separating them at the finish. There was early drama as the race was stopped when defending champion Gerard Kinghan crashed out on the IFS Yamaha at the first chicane, sustaining a reported hand injury. The race was rerun over four laps and Phillips stole an early march, with Kirk coming through to stake his claim for the spoils. However, Phillips held on to open his USBK account in style as he made the perfect debut for his new team. 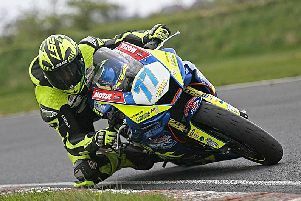 Behind Kirk, Adam McLean took third on the McAdoo Kawasaki as he used the event for extra track time ahead of next month’s Cookstown 100 road races. Aaron Armstrong, Ryan Gibson and Barry Graham completed the top six. In race two, Phillips again made a flying start and from there he was able to dictate matters on his Kawasaki. He was chased by McLean, but Phillips held on to wrap up a Superbike double by 1.2 seconds, with third going to Armstrong. Castledawson’s Nico Mawhinney, making his racing comeback this season following injury, finished fourth on the Team Polaris Kawasaki ahead of Gibson and James Kelly. Phillips was also the man to beat in the Supertwins races as he made his debut on the ILR/Coverdale Paton, which he will race at the North West 200 in May. In race one, he surged clear to win by over six seconds from Cahal Graham on the Italian machine and his margin of victory was even more commanding in race two, which he won by 18 seconds from Carrick man Ross Irwin, who is the brother of British Superbike racers Glenn and Andrew. Jason Lynn continues to set the benchmark in the Supersport class after he rattled off a double, beating Christian Elkin and Paul Jordan in race one, with Jordan taking the runner-up spot second time out, when he finished 1.8 seconds back on his 600 Yamaha as the Magherafelt man clocked up some miles in readiness for the start of the new road racing season. Darryl Anderson and Darryl Tweed took a win apiece in the Production Twins races, while Woolsey Coulter – making a racing return at Bishopscourt – and Jamie Lyons shared the wins in the Moto3 class. Stephen McKeown and Kris Duncan won the Lightweight Supersport races.